I too often find that individuals neglect to put an estate plan together because of the common misconception that estate planning is only for the ultra-wealthy. Since it’s a process that invariably forces clients to consider their own death, others may also opt to put it off because it can be very difficult emotionally. On the other hand, even higher-income individuals often underutilize the tax advantages of estate planning techniques and available products in their portfolios. This can lead to hefty taxes, dramatically reducing the amount of wealth they originally anticipated would be transferred to the next generation. In order to help convey the importance of estate planning to our clients, the MetLife Premier Client Group has developed the infographic featured here. 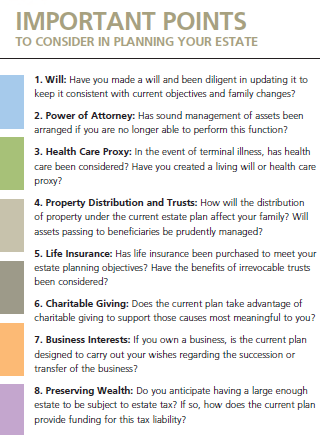 This checklist is a valuable tool to use with clients as it concisely covers the paramount factors to be considered when developing an estate plan. In fact, one of my clients nearly fell into the exact tax trap I mentioned above. Although the couple thought they took the correct measures to ensure their loved ones were left with ample funds to continue their current lifestyles, they did not consider the full implications of taxes on their overall financial portfolio. Working with the clients’ tax and legal advisors, an in-depth, holistic analysis of the clients’ financial situation revealed that they had done a great job of saving and investing throughout the years. They had diligently built their wealth and were in a position to leave their heirs well off. However, in reviewing their finances it was discovered that, if left unchanged, their portfolio would dwindle to a mere 60 percent of its current statement value over the coming years if strategic actions weren’t taken. Needless to say, the clients were shocked at this revelation. Fortunately, we were able to protect the growth that they had accumulated using tax efficient strategies and products, such as life insurance in their overall estate plan. Crisis averted. This is just one example of how we used this checklist to reveal inefficiencies in a client’s wealth transfer strategies. Another client, who happens to be a small business owner, came across some potential pitfalls when we reviewed his retirement plan. He owns an automotive service business with multiple branches that his children now manage. The client wanted to use the business as a source of income in retirement but ultimately transfer it to his children. After digging into the existing situation, the client was amazed at the various contingencies he had not accounted for. For starters, there was no agreement in place for the business to transition to the children. With no preexisting agreement, various open-ended scenarios could arise that could lead to disagreements on who assumes the remaining interest of each portion of the business. Furthermore, we discovered that there was an existing line of credit on the business with a note callable at death and insufficient assets within the business to cover said note. In the event that the client died, the bank would be forced to seize personal assets, a major liability to his surviving spouse. The solution: We used a variety of products and strategies to resolve the inadequacies of the client’s existing plan. The first area of concern for all of our clients is their immediate family, and business concerns are secondary. We addressed the family’s potential future needs including using various insurance products. First, was a life insurance policy that would cover more than the value of the line of credit, and therefore protect his wife from being liable to the bank. Next, we set up an additional life insurance policy specifically for his wife’s retirement needs, so that she would have the means to cover living expenses in the event of the client’s passing. Finally, we structured a buy-sell agreement that fit the client’s vision for exiting his business and passing it on to his children. With his new estate plan in place, he is covered for just about any scenario and is able to worry much, much less. Just one aspect of estate planning can hold a wide range of complexities and scenarios to account for. Using a checklist like this helps ensure that we uncover and address all of them, and helps provide clients with greater peace of mind. Brian A. Beasley, LUTCF, MBA, is financial services representative, MetLife Premier Client Group. Brian may be contacted at brian.beasley@innfeedback.com.